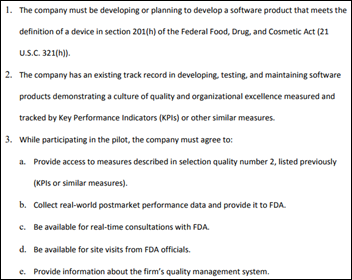 FDA announces its “Pre-Cert for Software” program that will certify digital health developers (instead of their individual products) for fast tracking to market. Up to nine self-nominated companies that are working on software that meets the definition of a medical device will be chosen for the pilot. 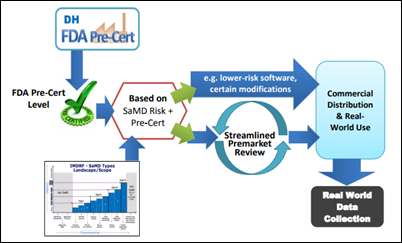 The goal of our new approach is for FDA to, after reviewing systems for software design, validation and maintenance, determine whether the company meets the necessary quality standards and pre-certify the company. Pre-certified companies could submit less information to us than is currently required before marketing a new digital health tool. In some cases, pre-certified companies could not submit a premarket submission at all. In those cases, the pre-certified company could launch a new product and immediately begin post-market data collection. Pre-certified digital health companies could take advantage of this approach for certain lower-risk devices by demonstrating that the underlying software and internal processes are sufficiently reliable. The post-market data could help FDA assure that the new product remains safe and effective as well as supports new uses. FDA also announces in its Digital Health Innovation Action Plan that it will hire more staff for the digital health unit of its Center for Devices and Radiological Health. It will also launch an Entrepreneurs in Residence program in the next few months. From Vera Gemini: “Re: Mediware. Bill Miller, former CEO of OptumInsight, is taking over from Kelly Mann as CEO.” Verified. Miller left OptumInsight in an April 2017 executive shuffle. Private equity firm Thoma Bravo sold Mediware to another PE firm, TPG Capital, in February 2017. Mann was hired as CEO in September 2007 following his 24-year career as SVP of marketing operations for 3M Health Information Systems. 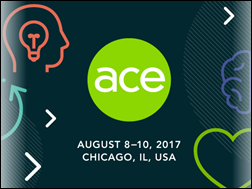 From MDRX ACE Sponsor: “Re: Allscripts ACE user meeting in Chicago August 8-10. They don’t have the usual big party scheduled for the second evening, which has been a staple for the last dozen years with big acts. I’m curious if anyone knows why this was changed – financials, liability, McCormick Place issues?” The agenda lists ACE Fest for Day 3, although it’s running from 4:30 to 6:30 p.m., timing that sounds more like happy hour. A reader who wishes to remain anonymous donated $50 to my DonorsChoose project, which actually fully funded a $200 project thanks to a $50 match from my anonymous vendor executive and then a $100 match from State Farm. Ms. L’s first grade class in Texas will receive math manipulatives as a result. This week on HIStalk Practice: Commonwealth Primary Care ACO taps Sonora Quest Laboratories for testing, analytics. Orthopaedic Associates of Michigan enlists Code Technology for patient-reported outcomes program. Idaho and Utah connect HIEs. Patients place physician experience above all else in satisfaction surveys. Legislators launch the Medicare Red Tape Relief Project. ATI Physical Therapy develops patient-facing, portal-friendly app. McKesson Specialty Health’s Calvin Chock offers guiding principles for designing a useful healthcare mobile app. Privia Health grows like gangbusters in Georgia. Rehab therapists cite documentation as their biggest challenge. Cerner reports Q2 results: revenue up 6 percent adjusted EPS $0.61 vs. $0.58, meeting earnings expectations but falling just short on revenue. McKesson reports Q1 results: revenue up 3 percent, adjusted EPS $2.46 vs. $3.15, missing analyst expectations for both. Shares dropped slightly in after-hours trading and have shed 18 percent in the past year. Working on health-related applications for Amazon Echo and Dash Wand. Heading up the 1492 team are Kristen Helton, PhD (above) — a bioengineer who co-founded body sensing technology vendor Profusa –and Cameron Charles, PhD, an electrical engineer whose background is body-worn consumer electronics. The 1492 group listed several open positions that were apparently removed once the article made the project’s existence widely known. 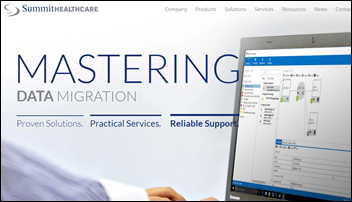 RCCH HealthCare Partners (TN) chooses Summit Healthcare’s Exchange interface engine and migration services for its 17 regional health systems in 13 states. HIMSS names Hal Wolf as its new president and CEO, replacing the retiring Steve Lieber. His background is quite different than that of Lieber, who spent his career as an association executive. Wolf comes from a vendor (The Chartis Group), but has also worked at Kaiser Permanente in IT and operational leadership roles. For those who know him, care to speculate how he will change the HIMSS agenda? Particularly since EVPs John Hoyt and Norris Orms announced their retirement in February 2016 (although both are working elsewhere), leaving Carla Smith as the only long-time senior executive. Drew Madden (Nordic) joins newly formed consulting firm Evergreen Healthcare Partners as a co-founder and managing partner. Tom Schultz (HealthStream) joins Evariant as chief growth officer. Carex Consulting Group hires Casey Liakos (Huron Consulting Group ) as president. Victor Arnold (Huron Consulting Group) joins University of Missouri-Columbia as executive director of University Physicians and associate dean of the school of medicine. Four-bed Southern Inyo Hospital (CA) goes live on Medsphere’s OpenVista Cloud. Adobe will retire its perpetually buggy, security-challenged Flash graphics package at the end of 2020 as open web technologies such as HTML5 have largely replaced it. Steve Jobs basically killed Flash in declining to support it on Apple’s mobile devices because it is: (a) proprietary; (b) unnecessary given the H.264 video format; (c) the number one reason Macs crash; (d) a poor performer on mobile devices; (e) a battery hog; (f) incapable of supporting touch-based interfaces; and (g) pushed on developers by Adobe to write cross-platform apps even though Adobe is slow to adopt OS enhancements. Microsoft’s Asia research group develops a usable prototype of Path Guide, an Android app that provides low-cost, plug-and-play navigation services for inside buildings without relying on the phone’s GPS satellite connection or requiring building infrastructure. 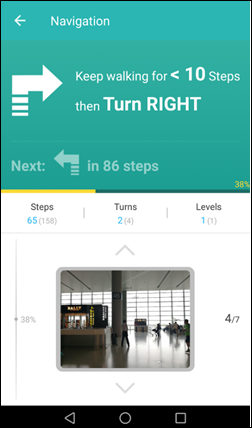 A “guide” starts the app’s recording function and then walks to the destination to create a “trace” that others can follow in real time as they walk. The guide can add photos, video, or voice recordings to explain further. This could be an amazing benefit to patients and families trying to navigate around illogically laid out hospitals. Erie County Medical Center (NY) has spent $10 million to recover from its April ransomware attacked, half of the money spent on computer hardware and software and the remainder attributed to overtime pay and lost revenue. The hospital says it was lucky to have beefed up its cyber insurance coverage from $2 million to $10 million a few months before the attack that took 6,000 of its computers down. 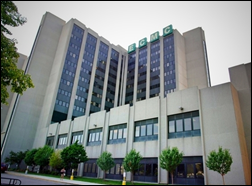 ECMC says the hacker applied a brute force password attack to gain access to an incorrectly configured web server that was secured by an easy-to-guess password. 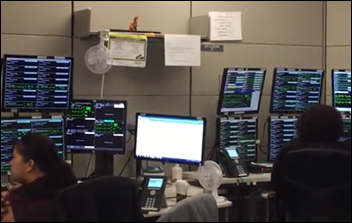 The local paper covers the 200-employee virtual hospital of CHI Franciscan Health (WA). In Ireland, a review finds that 21 infants experienced care delays because their referrals were sent by fax, which is the standard method of 80 percent of hospitals there vs. those 20 percent that have switched to electronic referrals. Twitter shares dropped sharply Thursday after the company announced that its global user count was unchanged in the most recent quarter as its US user count actually declined. Twitter says it will focus on trying to get people to use its platform every day to increase its attractiveness to advertisers. 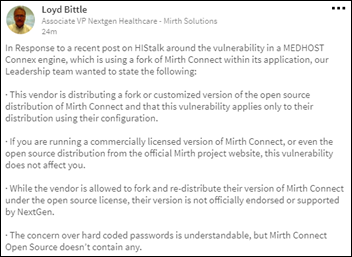 NextGen Healthcare clarifies via a LinkedIn post that the HIStalk reader-reported rumor about hard-coded passwords in Medhost’s Connex – which is based on NextGen’s Mirth Connect – is not a problem with the Mirth Connect product itself but rather Medhost’s distribution of a forked version of the open source product. The local paper highlights LogicStream Health in its look at Minnesota venture capital funding in the first half of 2017. LogicWorks CEO Kenneth Ziegler discusses AWS growth on the Cheddar Network. Nordic opens a 6,000 square foot expansion of its Madison, WI office. Meditech is recognized as a healthcare innovator in the latest “Best of Canada” report. Emmem Ekorikoh of Obix Perinatal Data Systems, developed by Clinical Computer Systems, joins the board of Black Diamond Charities. CloudWave joins the Cloud28+ global community of independent cloud service providers. GE Healthcare names Catherine Estrampes president and CEO of GE Healthcare Europe. Healthgrades announces its 2017 Women’s Care Award recipients, and publishes a related report on how hospitals can provide optimal maternal care. InterSystems will exhibit at AACC’s Annual Scientific Meeting & Clinical Lab Expo July 31-August 4 in San Diego. Of course if you get the gvt to pick up /elim most of the bad debts (usually 5% of gross) thru Obamacare how could you not make money. Has little to do with EHR. Which is why AHA, et al, are fighting repeal vigorously. FDA announcement: Now voluntary…guess what’s next? If you want to see/know what comes next check out what blood bank software vendors need to go thru to issue a minor new release. It makes ONC Certif look like childs play. Watchdog is conveniently ignoring two things: 1) Epic’s data also includes a decade of when the opposite was true… Charity up and revenues decreasing. 2) They also have a chart that shows epic vs other margins on parallel paths over years – with same dips and peaks, but epic several points of margin higher. 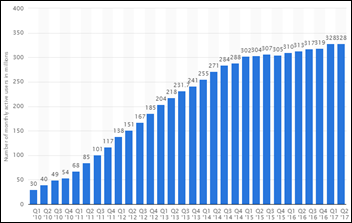 The viewpoint that a hospital which can purchase an EHR which requires 3 times the up front capital must have a higher operating margin before the purchase is obvious. The fact though is that those same hospitals have a reduced operating margin after purchasing that shiny new and expensive EHR. It would be great if Epic would share its data which shows how strong the financials of its hospitals are in comparison to clients of other EHRs as CMS cost report data shows otherwise. Reductions in charity care costs are par for the course when you reduce the number of uninsured. 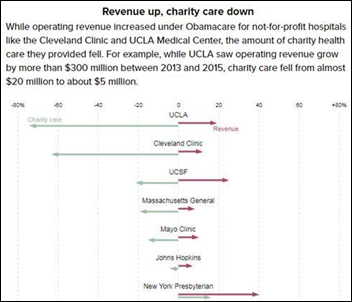 (#ThanksObama) Charity care doesn’t necessarily mean “charitable giving” as much as it means “writing off costs for caring for the uninsured or underinsured.” Let’s see the numbers for hospitals in areas that saw increased Medicaid expansion. Charity care likely decreased there too. You’re conflating two concepts. Epic is saying that profitability rose in comparison (the important point) to other vendors going through the same reimbursement climate. The real “waste, fraud, and abuse” conversation here should be about Cerner. With no new sales much bigger than a community hospital conversion or two, looks like they have reupped their multi-year process of getting fat off of their “minibar mentality” government contracts. Where are you getting your information from? You do realize that Leidos owns the DoD contract, not Cerner, right? Cerner receiving approximately 10% of that entire contract, so they aren’t really “getting fat” of government contracts as you say. Cerner may also be the “chosen” vendor of the VA, but they also do not own that master contract either, it will most likely be Leidos or another contractor. Cerner just had their all time high in bookings this past quarter (its public information) and most of that is NOT government related. It appears you just either had a bad experience with Cerner or you have some axe to grind with them, but your argument isn’t really supported by the facts. Excellent, that is the first I had heard of it and didn’t get to read the transcript at the time. But thank you for providing “factual” information, it is very appreciated. That was essentially my point, lets focus on the facts instead of biased opinions about this system vs that system. I am happily corrected in this instance. As long as I have known Hal, he has been at the forefront of innovation and the intersection of strategy with operations. Hal leads with the consumer and patient experience and advocates for the clinician’s needs and viewpoint to enable proactive care. Believe he will set the tone and facilitate the way forward for digital health over the next 20 – 25 years. Baltimore Ravens offensive lineman John Urschel retires – apparently after reading new studies about football-caused brain damage – and will pursue a PhD in mathematics at MIT. Much better use of his head. 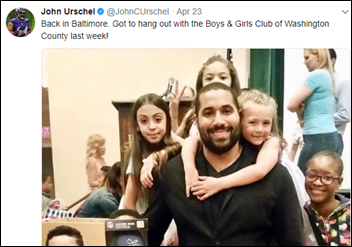 John Urschel. Smart, handsome, athletic, good with children, probably has some bank. I’ll bet his tears are concentrated Irish Mist and his socks smell of alpine meadows!! I agree that Epic hasn’t effectively proven causality. That said, their margin charts show that the average switcher not only survives, but improves – and it’s a big data set of those who switched. Through ACA or not ACA. Through billing vaporware from Cerner or billing vaporware from Siemens. You won’t have a true comparison until we compare this group to a group that switched from Cerner to Epic or Allscripts to Epic. So far, that data set is slim to none. Just talk to the customers who have switched to Epic… it’s a night and day difference in how much better Epic is than the competition. I’ve spoken with 7-8 major facilities that have switched to Epic…all have good things to see on and off the record. Yet to find that with anyone else. Epic’s operating margin charts are based on a biased data set which only includes non-profit hospitals. It is also not documented well enough for anyone to confirm its accuracy. Below is the link to the only same hospital pre-live to post-live comparison that I have seen. It is fully documented. Really? You’re going to cite a 4-year old study. That’s a long time in software development cycles. Funny, if MEDITECH was so good, why does Epic keep winning? Again talk to 7-8 major facilities that went Epic all will have good things to say on and off the record. Also, that sample size of 4 facilities actually running MEDITECH with greater than 250 beds could almost be considered an outlier. So to my example, you can’t even talk to 7-8 facilities greater than 250 beds running MEDITECH. The documented aspect of the study also shows they had clear data quality issues as they had to remove “outliers”. On the surface that doesn’t sound too bad until you realize they’re using financial data that is either accurate or it’s not. It’s not like collecting data from a sensor where a few times that sensor might produce bogus data. If one piece of that financial data is inaccurate, that means even a piece of data that looks accurate is potentially inaccurate. Odds are there were a few very profitable Epic facilities that showed grand improvement (as happens sometimes) and this study decided to exclude it or they included data that fit their outlier criteria that was totally inaccurate. RE: Four-bed Southern Inyo Hospital (CA) goes live on Medsphere’s OpenVista Cloud. 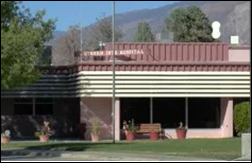 Like many frontier hospitals, Southern Inyo, seems to focus their capital on replacing IT systems as the cure to their ills. They would be farther ahead investing in the recruitment, training and retention of staff to operate those systems. Good luck with this latest change.